That most trusted service for making online purchasers more convenient? A perp for robocalls? This is an infringement on the Dot Com lifestyle! After getting heat for a new service agreement that allows the company to bother users with robocalls and text messages, the online payments service started a serious backpedal, now saying it will allow users to opt-out. Still, their chosen method of doing so is beyond clunky. Customers would have to do so by contacting customer service. The proposed agreement, made public earlier this week and slated to go into effect on Wednesday 1 July, would even have allowed PayPal to employ phone numbers that the user did not disclose. That would mean, one assumes, your other phone numbers discovered through data matching. The agreement provides only way to opt-out: close your account. On Friday 5 June, General Counsel Louise Pentland posted “An Update on How We Contact You” on a PayPal blog. Pentland wrote that there is “some confusion and concern in the media and with some of our customers,” but added that the section is not new and the relationship with customers doesn’t change. If you don’t want such “autodialed or prerecorded message calls,” a link to contact customer support is provided in her statement. The link leads to a form which doesn’t specify the opt-out, but is simply a log-in to your account. There have been reports from users that customer support isn’t helpful in providing these opt-outs, although PayPal has apparently sent out an internal memo on the subject. You consent to receive autodialed or prerecorded calls and text messages from PayPal at any telephone number that you have provided us or that we have otherwise obtained. We may place such calls or texts to (i) notify you regarding your account; (ii) troubleshoot problems with your account (iii) resolve a dispute; (iv) collect a debt; (v) poll your opinions through surveys or questionnaires, (vi) contact you with offers and promotions; or (vii) as otherwise necessary to service your account or enforce this User Agreement, our policies, applicable law, or any other agreement we may have with you. The agreement also gives PayPal the right to share the number with affiliates who can “assist us in pursuing our rights or performing our obligations.” Since those rights and obligations include contacting the user with promotions or surveys, it appears the agreement allows PayPal’s vendors to also hound users with robocalls and texts. We won’t share your phone number with third parties for their purposes without your consent, but may share your phone numbers with our Affiliates or with our service providers, such as billing or collections companies, who we have contracted with to assist us in pursuing our rights or performing our obligations under this User Agreement, our policies, applicable law, or any other agreement we may have with you. 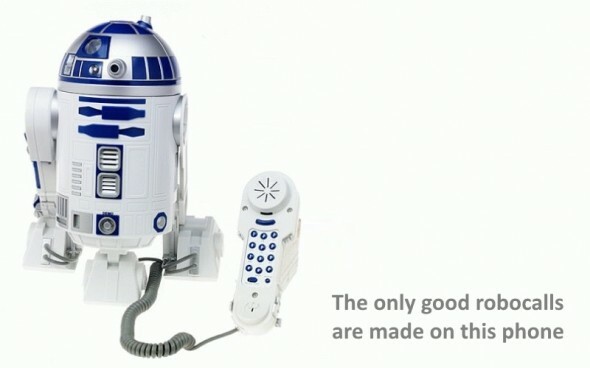 Frankly, here’s how I beat robocalls. It’s based on my observation that hardly anyone I know uses hard lines anymore. I have one because it comes with my Comcast bundle — that’s another rant for another time — so I simply set the phone to two rings on the lowest tone and then give that number anytime I’m asked to post a phone contact online. Thus, the robocall disappears into the oblivion that is the hard line voicemail I intentionally never set up, and those from whom I want to hear have my smartphone number. Issue resolved. No opt out required. The Dot Com lifestyle continues uninterrupted.